The monument commemorates those from the district who died in service or were killed in action in World War One. The memorial is approximately 3 metres high pillar topped with an effigy of a castle tower, surmounted on a white marble pedestal and three-tier pink Macclesfield marble base. An effigy of a cannon ball is located at the top of each corner of the pedestal. 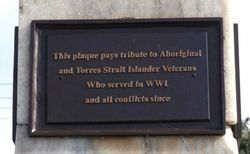 Four brass plaques on each face of the pillar, two with artillery signaller (Front and Left faces), two blank. The memorial is enclosed within a steel tube and wire mesh fence containing rose bushes. Auburn, May 27. The erection of a fitting memorial of the soldiers of this district who fell in the great war has for some time past been under consideration by the public. A strong committee was appointed, with Dr J. W. Yeatman as chairman and Mr. J. W. East secretary. An immense amount of work was necessary to finalize the matter. Last Sunday afternoon there was a gathering of about 1000 people at the junction of Main and King streets, when a handsome monument was unveiled. It takes the form of an enriched monolith, standing on a moulded base 12 ft. x 12 ft. x 3 ft. 3 in., and supported on three tiers of steps of pink Macclesfield marble. 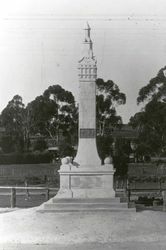 The whole of the monument is of white Angaston marble, specially selected from Mr. W Laycock's marble quarries. All material and workmanship are entirely South Australian. The height is 21 feet, and the weight 13 tons. The design was drawn by Mr. Edward Davies, architect, of Currie street, Adelaide, and the work of manufacturing and erecting by Mr. W. Laycock, Waymouth street, Adelaide. The total cost of the monument was £430, all of which was raised by private subscription. The cement concrete base was supplied by the District Council of Upper Wakefield. Kapunda Herald (SA), 4th June 1920.